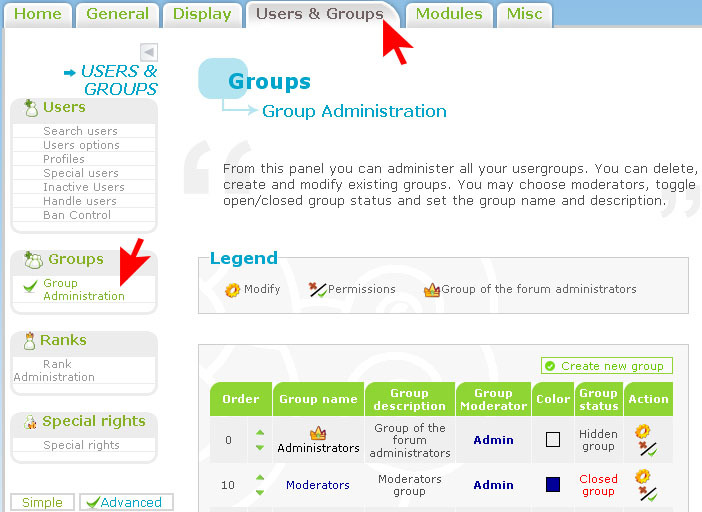 When you first create your forum, you will find your groups in your admin panel in "Users and Groups >> Groups Administration". You will find two are already made, administrator and moderator. The title of these, and any other group you create, shows in the legend bar at the bottom of your forum, when set correctly. You will see in the above picture, the two create a group buttons, above and below the 2 groups present. Click either of them they both lead to the same page shown below. Fill in the name of your group first followed by the description. The group then needs a moderator, either add your own username or another member of your team's user name. If you would like the members of your new group to have coloured usernames that show throughout the forum and in the legend, you can then click the box indicated in the screen shot below to choose a colour for your group. It wil automatically fill in the hex colour box to the right of it. If you have chosen to colour your group, check the 'color group members' box, then you can choose what order your group appears in on the legend. Number 1 appears first. Open: Anyone can ask to join this group and the moderator will approve or deny applications. Closed: Anyone can view this group, but they cannot request join it. Only the group moderator or administrator can add or remove members. Hidden: This group cannot be seen by normal members, the moderator or administrator can add to or remove members from it. Finally you can choose the type of member that is allowed to PM the members of this group. Once done click save. To modify a group you need to go to the same location again "Users and Groups >> Groups Administration. You will see a page that looks like the below screen shot. It shows all your groups. To modify any of the groups, click the modify cog in the actions column, of the group you want to modify. Click save when done. To set group permissions you need to go to admin>>>users and groups>>>groups. To see and set the permissions of any group, you will see in the actions column (screen shot above), beside the modify cog, a plus and tick symbol . Clicking that will take you to the permissions page like the screen shot below. 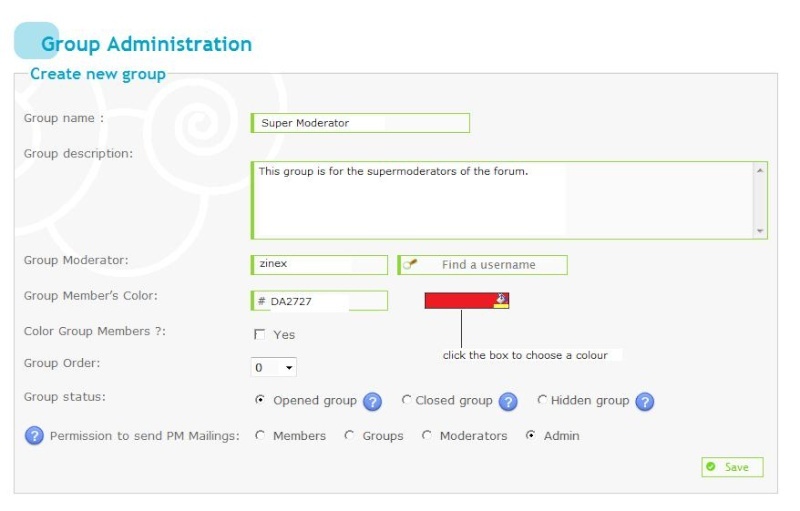 You can then select which forums your group will moderate, if any. Click save when finished. When a member requests to join a group you moderate, you will be sent an email informing you with a link you can click that will take you to the group requested. Alternatively you can check your groups at any time, by clicking the 'usergroups' link or button in your forum navigation bar. This will then show you a list of all the groups that have been made (excluding hidden ones if you are not the administrator). You can click on any group to see its members and at the very bottom of the group page you will see any requests to join your group as shown in the screen shot below. You can then choose wether to accept or deny a member. To remove a member, you would need to click on usergroups in the navigation menu and choose the group you want to remove members from. Click it and then check the boxes of any members you want to remove and click the remove button. Alternatively you are able to go to "Admin Panel >> Users and groups >> Groups" and click modify in the actions column. Under the group configuration will be a list of the group members. You can again check the box for any you want to remove and click save. Your group will only appear in the legend if the groups status is either open or closed. Hidden will NOT show up. Also it will only show if colour group members was chosen when making your group. If you are certain that both these settings have been chosen, go to "Users & Groups / User Options" in your admin panel and set "Colorize usernames" to YES.